Rarely does a 4 bedroom, 2 bathroom townhouse with a double lock up garage come to market! This is a fantastic opportunity to purchase a brand-new home, offering size and space in an ultra-convenient location. This contemporary style home has been finished to the highest of standards, and is jam packed with luxury inclusions that inspire a relaxed, coastal feel throughout. This impressive townhouse ticks all the boxes and deserves your inspection! - 4 large bedrooms, all with built-in cupboards. The master is serviced by a private ensuite. - The "spa" like family bathroom offers a separate shower and a luxurious free-standing bathtub. - The extra space on the upper floor makes an ideal "break out" area or study nook. - Gourmet kitchen includes high end appliances, stunning stone benchtops, island breakfast bar and plenty of storage. - The open plan layout along with high ceilings and a crisp, modern palette provide a sense of space and light. - The gorgeous timber deck, overlooks the generous size courtyard with easy care gardens and water tank. - Striking timber flooring and plush carpet throughout. - Separate laundry with an additional powder room located on the lower floor. - Double lock up garage with internal access – hard to find in a townhouse! - Positioned towards the rear of this quiet, boutique complex comprising of just 6 homes. 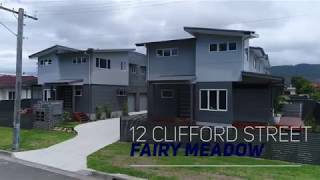 - Convenient locale, within walking distance to all the finest amenities Fairy Meadow has to offer including shops, restaurants, cafes, train station and beautiful beaches! Full depreciation schedule available upon request.